One of our annual tasks in the house, is to deep clean all of the rooms. Recently, I have been helping to finish off the Dining room before its goes to a night-time scene at the end of this month. Every morning we will dust flat surfaces and vacuum the visitor route but the deep clean takes it to the next level. It means moving most of the objects off any surfaces, dusting and inspecting both, checking for any damage. IT also means crawling under tables and chairs to get rid of cobwebs and dust as well as inspecting the carpets for insect activity like carpet beetle and clothes moth. This happens in every single room and corridor in the house that is open to the public. In the past, the majority of this deep clean took place in the winter months when the house was closed. But this year it has been different. We are now open for 363 days of the year, leading to interesting debates on the effect this may have (or may not have) on the collection. So the deep clean is now being carried out whilst we are open and in front of volunteers and visitors. As we are open longer, we have already noticed an increase in our work so trying to fit in deep cleaning can be difficult. Our Assistant House Steward always tries her best to plan days where at least one person can do the deep clean but it is the nature of heritage that things pop up. The Dining room has taken us 5 days over a 1 month period to complete and there is a noticeable difference to the room. A lot of the plates that look like they are cream are actually an off white colour, whilst the dust on the tablecloth also made it look yellow but it is now a lovely snowy white. Now that the Dining room is complete, it is off to start the next one – the Drawing room. This is by far one of the more complex rooms to deep clean as there is so many objects and pieces of furniture. I got to clean the Mosque lamp this morning, which matches the one in the Conservatory and were both bought during Mr and Mrs Beale’s world tour in 1906. Categories: Uncategorized | Tags: Arts & Crafts, Beale, bugs, Carpet, carpet beetle, ceramics, Chair, cleaning, collection, conservation, deep clean, Dining room, Drawing Room, House, new start, room steward, Showroom, Standen, the Dining room | Permalink. One morning very recently was more eventful than usual, when it became clear that a bird was trapped in the chimney of the North Bedroom. While this doesn’t happen very often, it is something that has happened a few times in the past here at Standen. We currently have inflatable chimney balloons to keep draughts and dirt out, but it doesn’t always stop birds from getting trapped or making their nests in the chimney. A trapped bird is obviously very distressed, and so if it is safe to remove the bird we try to do so. There are also conservation factors to consider, as birds can also cause serious damage to historic materials. A bird trapped in a chimney may fall into the fireplace; escaping into the house itself, and so there is the obvious risk that it could knock over and break historic objects. 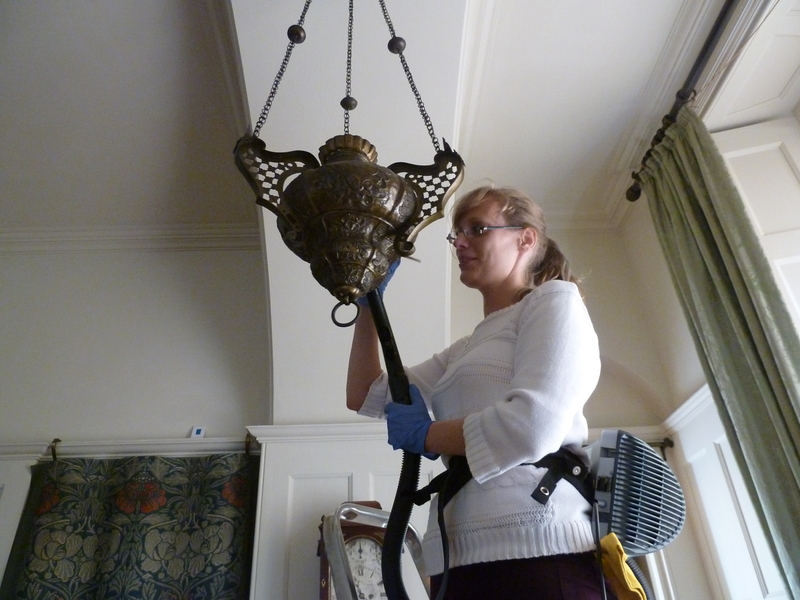 Bird droppings are acidic, and could cause damage to historic interiors that would be difficult to reverse. Bird nests, as well as dead birds, harbour pests such as clothes moth, carpet beetle and silverfish, which could make their way into the house, and are harmful to historic materials. Fortunately, on this occasion, the bird was very much alive (we could hear it flapping around! ), and luckily, there were a couple of members of staff who were willing to try and rescue the poor creature from the chimney. Dust sheets, poles and a box were brought along, and as many breakable objects as possible were moved out of harm’s way, just in case the bird escaped into the room and started flying around. The bird – a large crow – was dislodged from the chimney, and although it did briefly escape into the room itself, the quick-thinking staff members were able to throw a dust sheet over it, put it into a box, and release it into the courtyard, where it flew away. As I mentioned earlier, this isn’t the first time a bird has been on the loose in the house. A crow fell down the chimney in the Larkspur Dressing Room a number of years back, knocking a small glass vase off the mantelpiece and smashing it to pieces. A conservator was able to put the vase back together, piece by piece, and it once again sits on the mantelpiece. 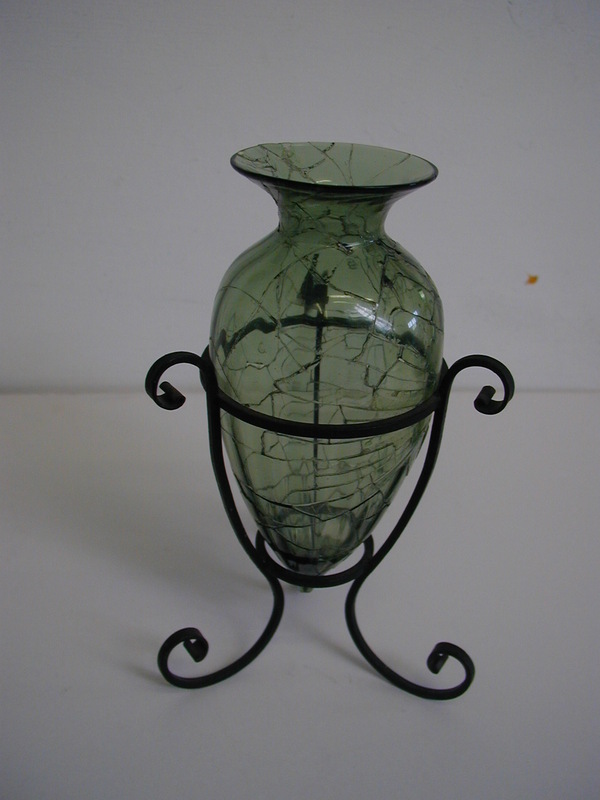 The vase is one of a pair, and if you look closely, you can see the difference between the repaired vase and the undamaged vase. The bird also left droppings on the frame of a painting – a small stain is still visible, having been cleaned off as much as possible at the time. It certainly makes for an interesting anecdote! Categories: Uncategorized | Tags: bugs, carpet beetle, ceramics, collection, conservation, Hannah, House, object, Showroom, Standen | Permalink. For the last couple of days, the house team have mainly been concentrating on emptying the Drawing Room of its contents, as the room is being redecorated next week. The paintwork is looking a little old and tired, and a new coat of paint should really brighten the room up. Of course, this does mean that there was the ‘small’ matter of where the room’s contents were going to be temporarily stored! Standen isn’t a large house, and aside from the permanent storage spaces that are already in use, we don’t have much in the way of additional storage space for our collection. When it came to temporary storage for the Drawing Room collection, we needed to utilise other showrooms – consequently we ended up with cushions on the billiard table, and an array of ceramics safely stored on the Dining Room table…a slightly odd sight! Although there were lots of objects to be moved, members from the house team – along some of our conservation volunteers – were on hand to help, and the move went a lot more smoothly and quickly than anticipated. 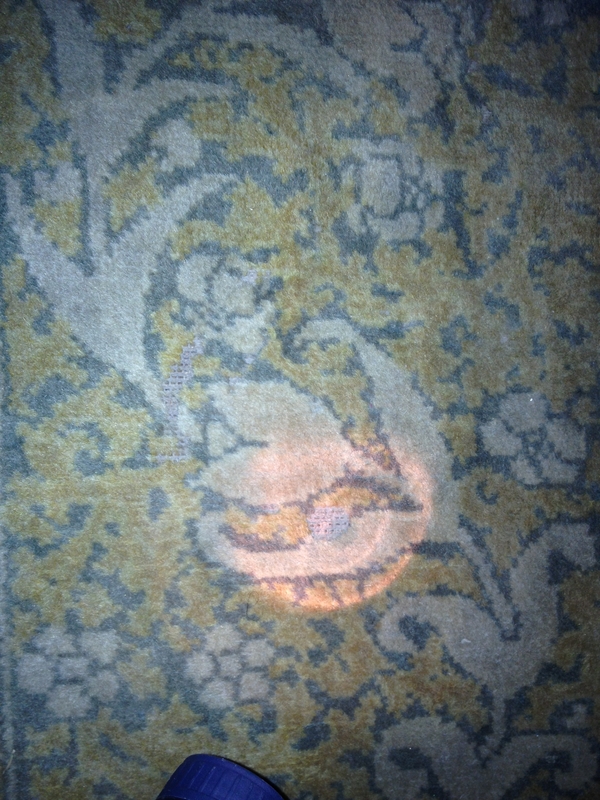 Clearing the Drawing Room of its contents was a good opportunity to properly inspect the room and its contents – in particular, the wallpaper and carpet. The wallpaper is a William Morris design called Sunflower, and looking at it closely, we could see that there was silverfish damage in places, although the damage didn’t seem to be quite as bad as we found in the Larkspur Dressing Room last week. 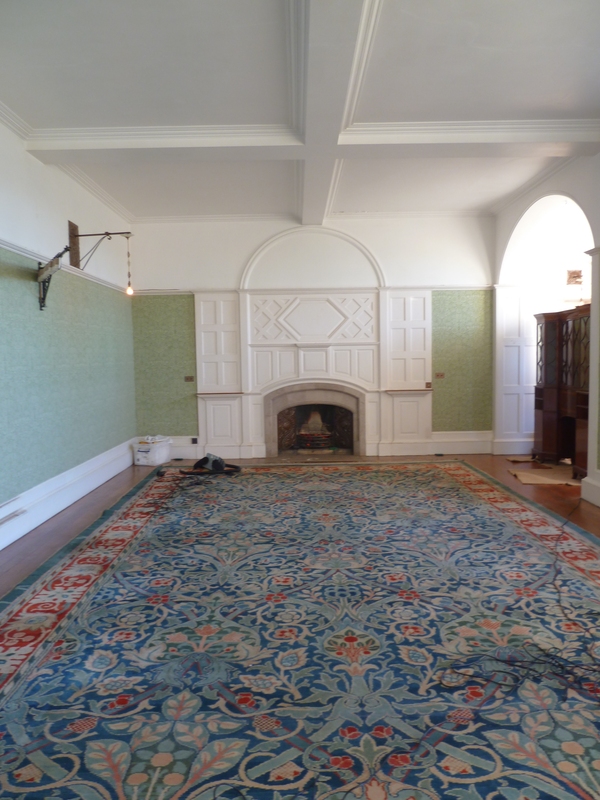 The carpet – also a Morris design – is huge, and almost fills the room. We were concerned that it may have fresh damage in places from carpet beetle, but because of its size, it was impossible to check the carpet thoroughly until we were able to completely empty the room – luckily, we could find no traces of new damage. The Drawing Room is a favourite of mine – it’s such a restful room, with so many wonderful features – and with the room empty, you could really appreciate the space itself. 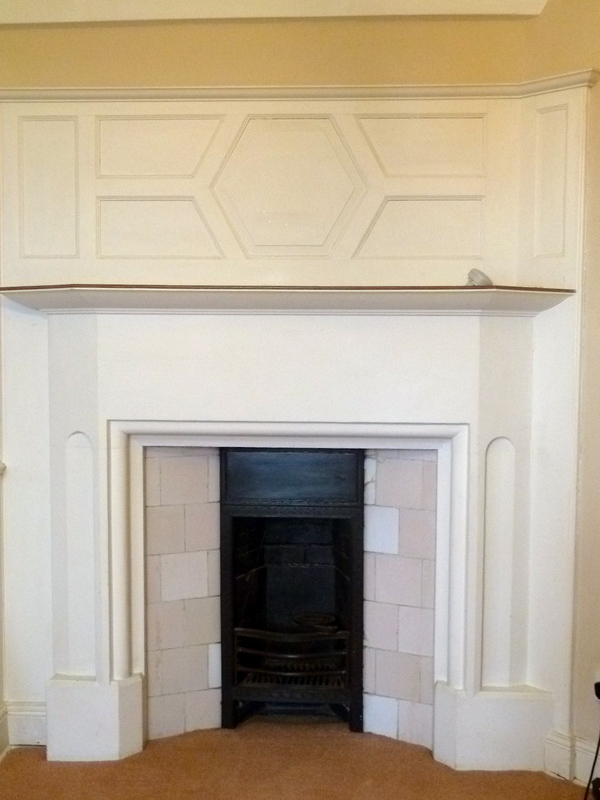 The craftsmanship that had gone into creating its outstanding features, such as the fireplace surround and the fretwork around the windows, was particularly apparent. The room looked so different, and we all agreed that it would make a fantastic setting for a dance or a party! Almost ready for the decorators! This is the first experience I’ve had of emptying a room, and it was interesting for me to see the logistics of safely moving heavy items of furniture and countless precious objects – and organising them so that they kept the order they were displayed in! 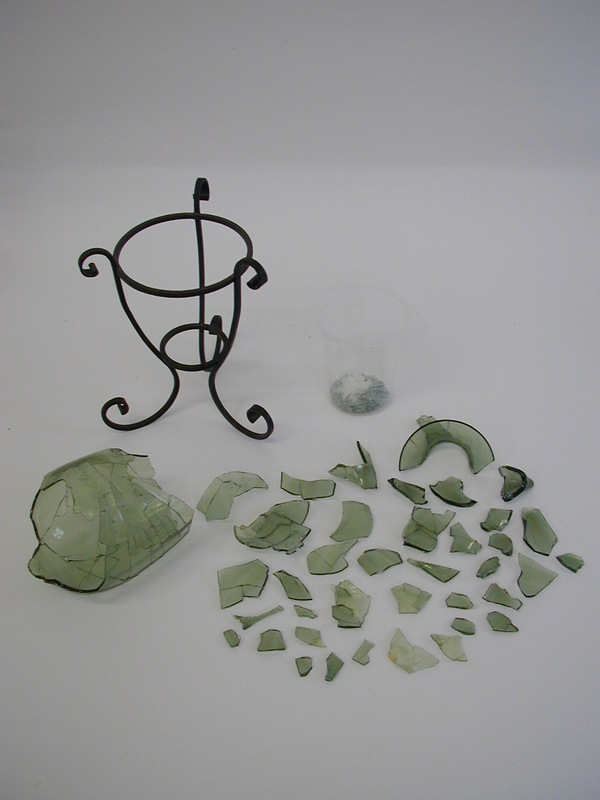 Fragile objects are removed bit by bit, which can often seem labour-intensive (a particularly fragile teapot lid was removed from the pot itself, and carried separately), but it really is the best way to ensure existing repairs or damage are not weakened. The heaviest and largest items of furniture – such as the huge, George Jack-designed display cabinet and the Morris carpet – will remain, covered in dust sheets in the centre of room, with the decorators working around them. Categories: Uncategorized | Tags: Carpet, carpet beetle, ceramics, cleaning, collection, Drawing Room, George Jack, House Team, Redecoration, Silverfish, Standen, storage, Wallpaper, William Morris | Permalink. At the top of what was once the servant’s staircase are a number of light, airy rooms. Some of the rooms were used by the family, and others formed the servant’s quarters. Unfortunately these rooms aren’t part of our visitor route, but they still require care and inspection from time to time (though not the same level of care given to our showrooms), because some of them are used to store objects from our collection. One such room is the Protection Store. In here we store all sorts of things: large rolls of original carpets, a Liberty & Co. bedroom furniture set that belonged to Helen Beale (the last family member to live at Standen), and a number of pieces of rather rare early William Morris lino – of a type called corticene – which is unfortunately too fragile to display. We’d been closely monitoring this room, as we suspected it might have a carpet beetle problem. We also knew that the storage methods used in the room needed improvement – the Morris lino was stored underneath a type of platform, which had enabled other objects to be safely stacked on top, but meant that the lino itself was stored directly on the floor, which wasn’t ideal. With the added risk of bug damage, we decided to overhaul the room in order to create a safer, more effective storage area. We emptied the room of most of its contents, and then evaluated the carpet beetle issue. We found that one area of the room’s modern fitted carpet was completely infested: ‘woolly bears’, the larvae of the carpet beetle, had been slowly eating their way through the carpet, and in that one part of the room, they were everywhere! It is rather unusual for a modern carpet to be so heavily infested with carpet beetle – modern carpets are often in rooms and buildings that are well used, and so carpet beetles and their larvae don’t often settle there. But this particular insect can be a real problem in historic houses, which are full of all sorts of carpets, tapestries and hangings – both historic and modern – in areas that are little used, which gives bugs a good chance to settle in and cause significant damage before they’re discovered, which is why it’s so important for us to closely monitor all of our showrooms and storage areas. 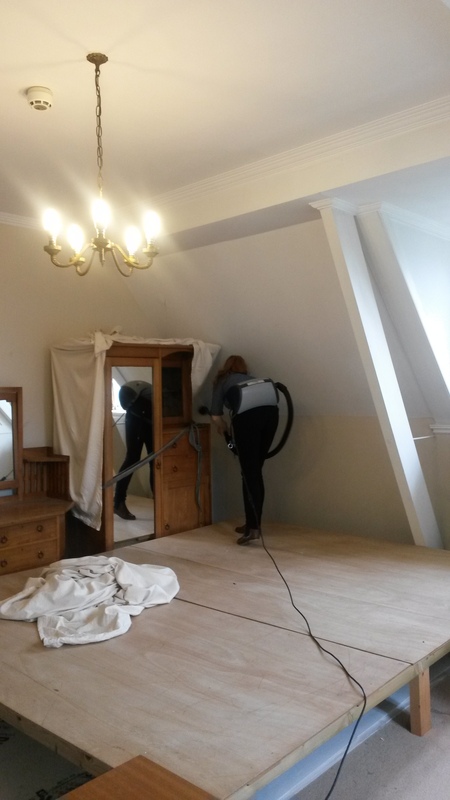 We started to conduct a hygiene clean of the room; sweeping away cobwebs, wiping down the paintwork and fire surround, getting rid of some harmless (but pesky) cluster flies, and trying to clean the infested carpet. After a while, we decided the fitted carpet was too risky to keep – by simply cleaning it, we wouldn’t be able to ensure that we’d eradicated all the bugs, and since it wasn’t an historic carpet, it was decided that we should dispose of it. Luckily the man that looks after our carpets was able to come the same evening, cut the carpet into pieces (as it was too big to remove in one go) and take it away with him. 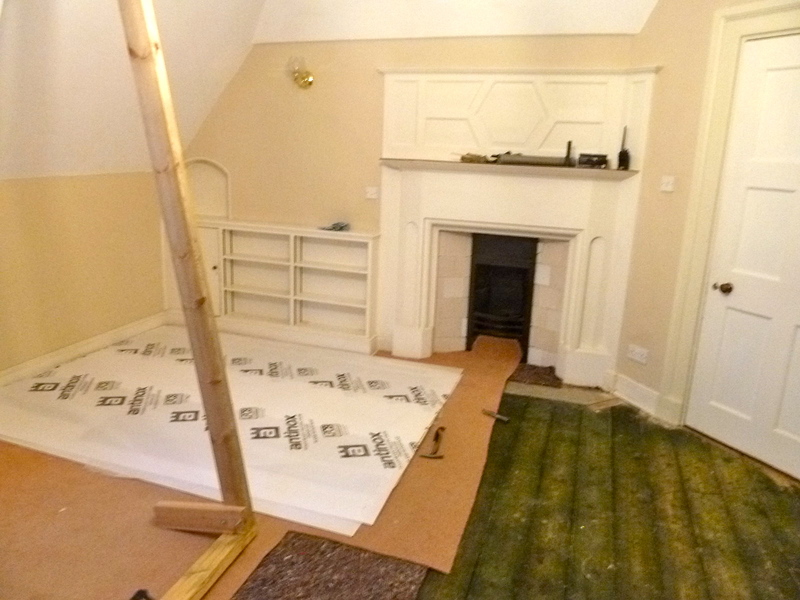 Having got rid of the infested carpet, we checked the historic carpets that had been stored in the room. They appeared untouched by the infestation, which is probably because they had been very well sealed in protective packaging; however a couple of the carpets were frozen as a precaution – this would help kill off any bugs that had been able to get inside the packaging. 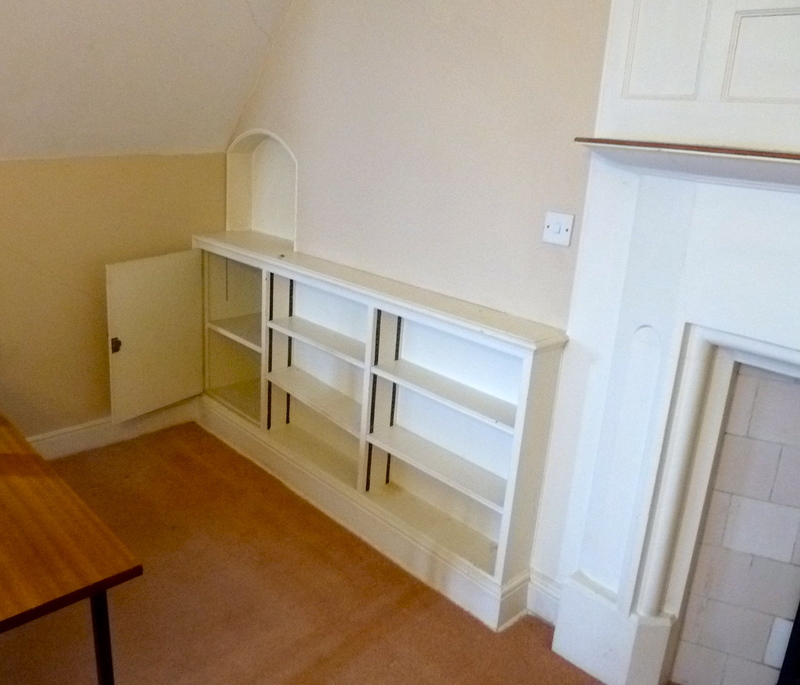 We’re not sure if this fitted shelving unit is a later addition, but we were pleasantly surprised to find it hidden behind rolls of carpets! With the room clean, empty, and bug free, the next step was to adapt the storage solutions to make them more effective…more on this next week! Categories: Uncategorized | Tags: bugs, Carpet, carpet beetle, collection, conservation, Fitted carpet, larvae, Protection Store, Standen, storage, William Morris, Wool, woolly bears | Permalink. As a new member of the House Team, one of the first tasks I got to grips with was the daily clean of the house. The morning is spent cleaning the showrooms and making sure the house is ready for our visitors, who will start arriving at 11am. 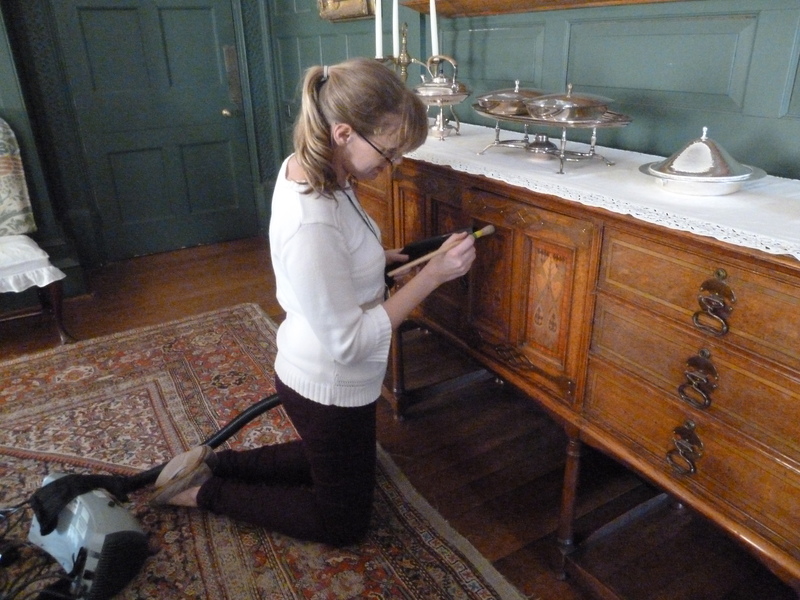 The daily clean is an essential part of the routine in any Trust property, and at Standen, the duties are shared between the Assistant House Steward, two Conservation Assistants and myself. Our deep clean is our chance to really get to grips with our showrooms; annually inspecting and cleaning them from top to bottom. The deep clean used to take place during winter months, when many Trust properties closed their doors to visitors, and put the house contents ‘to bed’. These days, however, many properties are open almost year round, and need to carry out much of their deep cleaning work in front of the public. 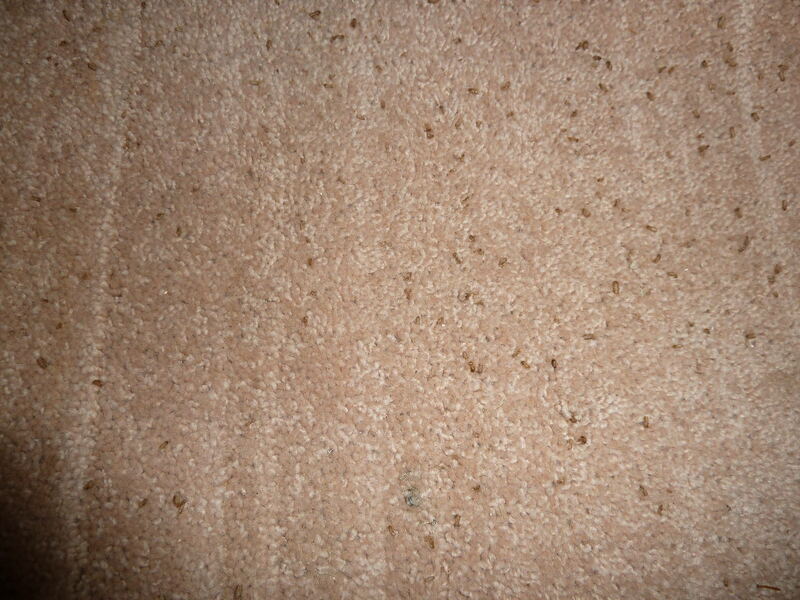 This summer at Standen, our deep clean revealed an outbreak of carpet beetle in one of our showrooms. 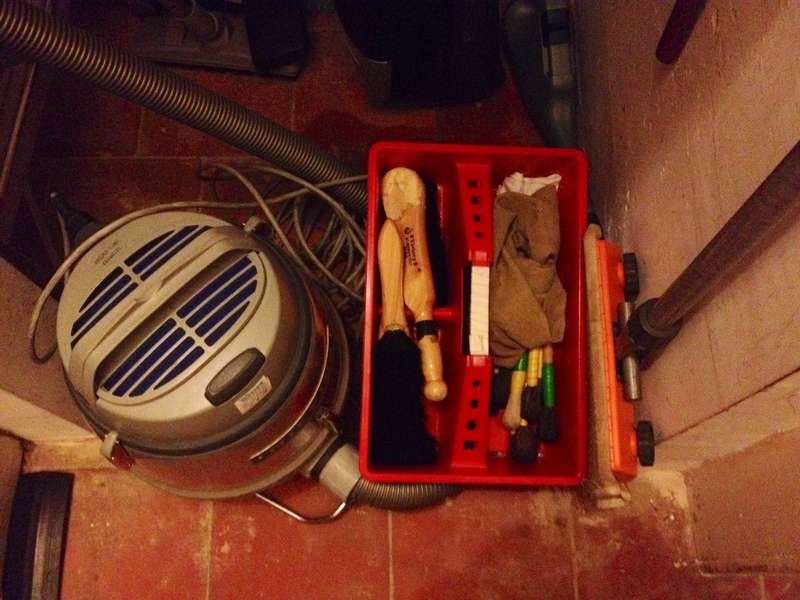 This needed to be dealt with straightaway – while the house was open to visitors! The carpet beetle outbreak was obviously a big problem for our collection (an original William Morris carpet was at risk of becoming seriously damaged by the bugs), but it was actually a great opportunity to highlight to our visitors the importance of inspecting and cleaning our collection, and acting swiftly when needed to prevent further damage. 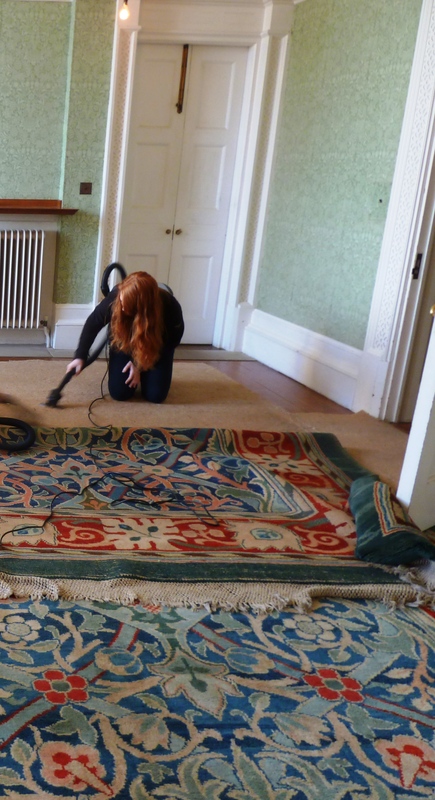 As a trainee, it was good for me to see the process, and how we dealt with it: in the case of this outbreak, we treated the carpet with a mild insecticide specially formulated for use in historic environments, and a smaller hearth rug was put in the deep freeze to get rid of any remaining pests. Categories: Uncategorized | Tags: Carpet, carpet beetle, cleaning, conservation, deep clean, House Team, Showroom, Standen, William Morris | Permalink.